Star Wars: Darth Vader: Dark Lord of the Sith Vol. 3: The Burning Seas Review – AiPT! Darth Vader Vol. 3: The Burning Seas hits comic book store shelves this week, collecting issues #13 – #18 of Marvel’s Star Wars: Darth Vader: Dark Lord of the Sith series. It chronicles the events on Mon Cala during the Galactic Civil War. The collection also includes Annual #2. Darth Vader and his Inquisitors are sent to Mon Cala by Emperor Palpatine to investigate a situation there. The Emperor suspects that King Lee-Char of the Mon Calamari is being advised on how to deal with the Imperial ambassador from an outside source, possibly a Jedi. Shortly after Vader’s arrival on Mon Cala, Imperial ambassador Telvar’s ship is destroyed, killing him. The assassination of Telvar the begins a war between the Imperials and the natives of Mon Cala. The king divides his strategy on two fronts. Commander Ackbar is to take the north, while Commander Raddus is to be in charge of defending the south region. Upon the influence and advice of Jedi Master Ferren Barr, King Lee-Char destroys the surface cities and structures on the planet’s surface. This makes it nearly impossible for the Empire to set up any base of operation on planet, and also forces them to take the fight underwater. The Mon Calamari evacuate to the cities deep below the surface of the ocean covering the planet. Ferren Barr gets word from King Lee-Char that Vader and his Inquisitors have discovered their whereabouts and are coming to hunt him down. Master Barr and his five acolytes evacuate their cave refuge. They take to the ocean and are soon overtaken by Vader and his forces. One by one, Barr’s young pupils are killed until only Barr and Varla remain. As Vader and the Inquisitors close in on them, Grand Moff Tarkin orders Vader to break off and secure Lee-Char. The former Jedi turned Inquisitors, along with the squadron of Death Troopers, trap Barr and Varla on a platform. The Jedi Master gives Order 66, and the Death Troopers turn on the Inquisitors, allowing for escape. The master and pupil part ways as Barr sets off to rescue the king. As Vader forces King Lee-Char to watch helplessly as Star Destroyers bombard thanks for the cities, Barr bursts in to the royal command bunker. There’s a climactic lightsaber battle between Vader and Barr for the fate of Mon Cala and to spark the Rebellion. This collection is wonderful. Charles Soule has written this great story that feels very organic, and he does a great job with the complexities of Darth Vader. The ghosts of the past still haunt him and his relationship to Grand Moff Tarkin is brought to light in this. You can definitely sense the tension between the two of them as the Emperor orders Vader to serve under the command of the Grand Moff. The story about Jedi Master Barr and his acolytes is very interesting as well. There is a great reveal at the end, during the climactic lightsaber duel, where we find out Barr’s true intentions and motivations behind advising King Lee-Char on his dealings with the Empire. The flow of the story is smooth and feels very much in sync with the Star Wars universe. The artwork on this series is very colorful and exciting. Giuseppe Camuncoli does a brilliant job of capturing the look and feel of Star Wars, yet throwing a little bit of style in there to make it a bit of his own. The battle scenes on Mon Cala are spectacular. The ferocity and intensity of Commander Ackbar and his forces as they defend their planet from the Empire is palpable. There are some great images of the Mon Calamari ships as they take off out of the ocean and up into space to attack the mass of Star Destroyers bombarding their cities below the surface. The colors on this book really add to the beautiful feel of the artwork. David Curiel knows how to make every page pop with action and color. Curiel amps it up with color from the intense lightsaber battles to the beautiful blue waters of Mon Cala. Overall this is a great collection from the Darth Vader series. The artwork is bright and beautiful to look at, with great action sequences and beautiful settings. It has a great story that ties in between Revenge of the Sith and A New Hope that gives the reader more of an idea of the involvement of Ackbar and of Mon Cala in the early years of the Rebellion. 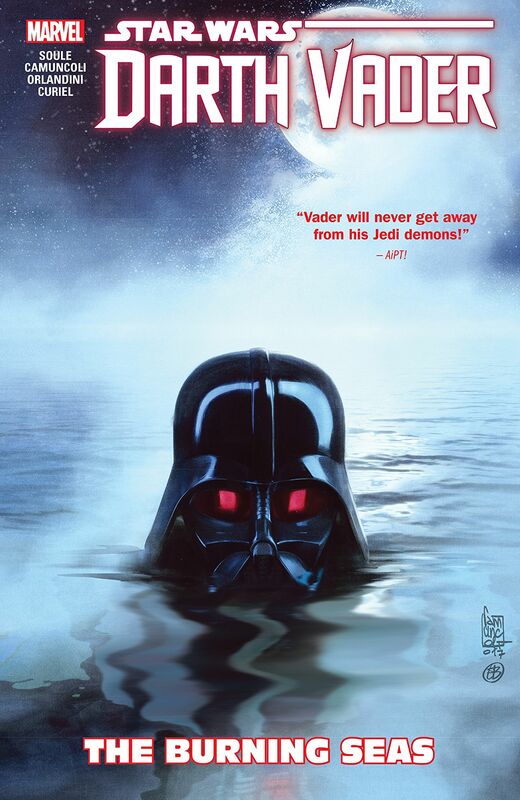 Star Wars - Darth Vader: The Burning Seas is a beautiful collection of stories from the Darth Vader series by Marvel. The story is masterfully written and the artwork is colorful action packed and beautiful to look at. Really great artwork that captures the look and feel of Star Wars. Dynamic story with some familiar characters and how they all tie into the early years of the Rebellion. Darth Vader and his Inquisitors look badass. This collection also contains a one-off story an issue number #18, as well as the annual #2 which ties Vader in with characters and events from Rogue One.